My first distinct memory of cookie decorating was at my aunt and uncle’s house when I was about 6 or 7 years old. All of our family and friends gathered in their sun room where several tables held bins full of huge sugar cookies in many shapes and sizes- giant snowmen and Christmas trees and snowflakes, icing in all colors, sprinkles, and candies. This new edible medium was heaven to me, a child with a love for experimental creative outlets and a serious sweet tooth. That time spent with loved ones was warm and cozy, with ample sugar to fuel our giddiness. Now that I think about it, I admire my aunt and uncle’s bravery for putting all of us little monsters in a room full of sugar only to let us loose in their house. Decorating cookies is now something of a tradition for me, and it brings back fond holiday memories! When people tell me they don’t like gingerbread cookies, I assume it might be because they haven’t had a fresh batch of the homemade kind. When I was in high school I would bake gingerbread cookies for all my friends, and most would come back very surprised that gingerbread cookies could be so tasty! These gingerbread cookies are nothing like the store-bought ones which are often hard and bland as cardboard. These are soft, warm from spices like cinnamon and ginger, and have just a little sugary crunch from royal icing. This recipe makes about 40 small cookies (1-inch wide) or about 2 dozen 1.5-2 -inch wide cookies. In a large bowl, mix molasses, sugar, butter, baking soda, salt, allspice, cinnamon, cloves, ginger, and eggs. Once these ingredients are fully combined, add 1 1/2 cups of flour, mixing on low speed for about 2 minutes. Increase speed to medium, and slowly add in additional 3 cups of flour until all ingredients are just incorporated. Separate dough into 4 portions and wrap three in plastic wrap. With a rolling pin, roll out dough in an even layer, about 1/8 in thick. It helps to spread a little bit of flour on the surface of the dough before fully rolling it out so it doesn’t stick to your flat surface or your cookie cutters. Cut out shapes with cookie cutters, and place on baking sheets covered with parchment paper. Space cookies out evenly, about an inch apart. These cookies will rise slightly, but do not spread out as much. Bake each batch for about 8-9 minutes for small, 1-inch wide cookies, or 10-12 minutes for larger 2-inch wide cookies. It’s best to bake batches of cookies in similar sizes so all the cookies on your tray bake evenly. Gingerbread cookies can be a little tricker to check for doneness visually because the dough starts out very dark- especially when using a dark molasses. Once they look solid, and are not wet in the middle they are ready to take out of the oven. Remove from tray and let cool on cooling racks for at least 15 minutes before decorating. Mix ingredients for icing in a medium size bowl and for more colorful cookies, separate portions of icing and mix in food coloring. I always spoon about a cup of icing into individual ziploc bags and cut off a tiny bit of one corner, but if you have icing tips, those are great too! Have fun decorating! Make sure to have plenty of sprinkles on hand, and any fun candies to add some flair. These cookies are so fun to make and are great for sharing with family and friends. 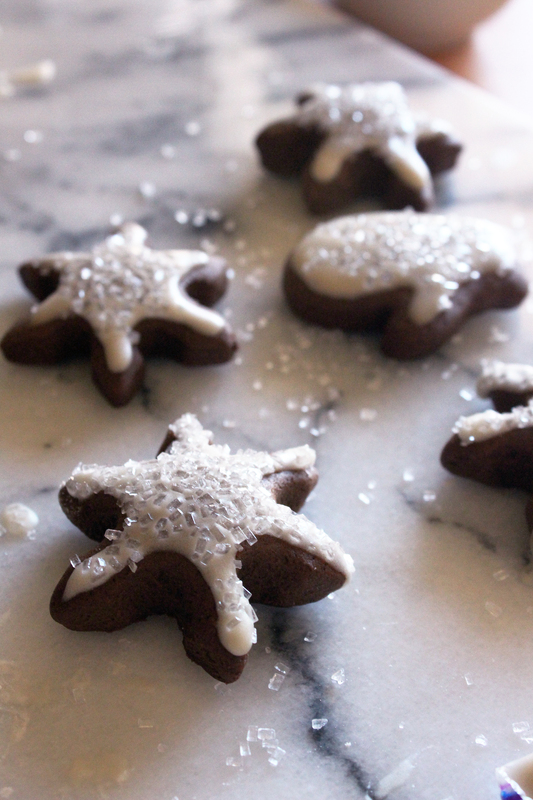 The possibilities for your own gingerbread cookies are only limited by your imagination! Love your photos and your cookies!! !